Opening February 7, 3-6pm through April 20. 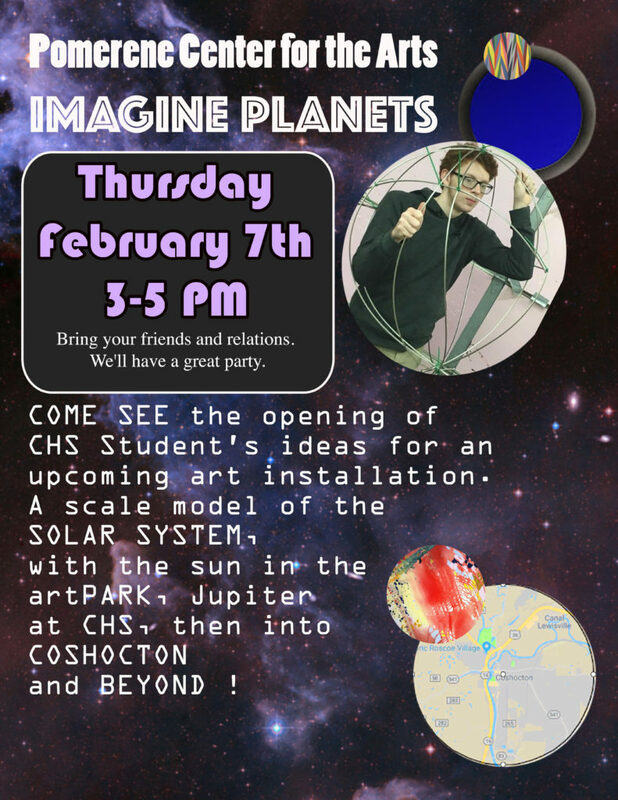 The exhibit features ideas and prototypes developed by CHS students from the Astro Club, Art Club and the Industrial Technology Classes as part of ART CONNECTS CHS. The ART CONNECTS 2018-19 problem is design and install a scale model of the solar system using stainless from AK Steel as a core material. The Sun will be placed at the Pomerene Center for the Arts artPARK and Jupiter at Coshocton High School. All other planets will be placed in town and out in the county according to their scaled orbits. The ART CONNECTS Team is soliciting input at the opening of the exhibition and is inviting the public to come see the models and ideas for this future project. Over the next months students will return to studio 211 with resident artist Voss Finn to determine the final details of the sun and nine planets before beginning the fabrication and installation phases of the project. The Ribbon Cutting for the finished Solar System Model will take place in the artPARK Friday, May 3 as part of Dogwood Youth Arts Celebration. Project leadership team: Students — Wesley Abbott, Simon Bell, Kate Brady, Katelyn Fick, Trinity Hysong, Lynsey Stonebraker and Justin Williams; Teachers — Mr. Kodysz, (Physics); Mr. Miller, (Art); Mr. Reichert, (Industrial Tech); Lead Artist —Voss Finn; and AnneCornell, Pomerene Center for the Arts Community Studio Artist.